Al Smith was one of the greatest high school athletic stars in Peoria history, earning All-State recognition in football, basketball and baseball. He went on to a brilliant basketball career at Bradley University and then starred for the Denver Nuggets and Utah Stars of the American Basketball Association. As a high scoring halfback, he led Manual to dominance in local football. He also pitched Manual to the state title in baseball in 1965, throwing a 12-inning shutout for Manual in the opening tournament game and pitching the last inning in relief the next day to assure the state championship. His basketball career at Bradley was one which earned for him All Missouri Valley and All American recognition. 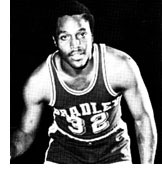 His 1,408 career points placed him among the top ten scorers in Bradley history. His exceptional passing and strong rebounding made him one of the most versatile players of his day.